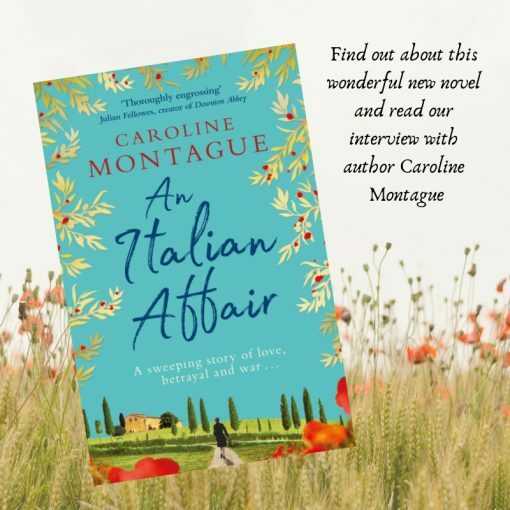 To mark the launch of her stunning debut novel we chatted to author Caroline Montague about “An Italian Affair”, her love of Italy and her favourite Tuscan recipe! Vorrei: Tell us a little about your new novel “An Italian Affair”, what inspired you to write it? CM: When I bought my house deep in the heart of the Italian countryside I was touched by the magic of its rich and diverse history. It inflamed my inspiration and made me long to capture some of the adventures and struggles my friend’s families had experienced first-hand during the war. I didn’t need much encouragement from them to tell their incredible story. If I hadn’t learnt Italian (admittedly to a very poor standard) they would never have imparted these small private gems, and I am eternally grateful to have learnt about the ghosts from the past and the people who inhabited the house and roamed the hills around me. Much of your novel is set in Tuscany – have you spent a lot of time there? My novel is set in England and Italy and it is about a family divided by war. It tells of their loves, their losses and their triumphs in two countries both torn apart by war. I spend as much time as I possibly can there, especially when I am embarking on a novel. The peace broken only by birdsong and the sound of crickets chirping is the perfect environment to write. What do you love most about Italy? The atmosphere, the warmth of the people, the warmth of the sun, the sense of space and colour the smells and food, I could go on forever. Tell us about your favourite place in Tuscany? The small hilltop town of Cortona bathed in sunlight in the summer but equally beautiful in the winter when the streets are silent, the tourists long gone. Here the winding alleyways lead from the medieval square upwards to a church at the top of the hill, and you can look from a viewing point towards Lago Trasimeno where Hannibal once brought his elephants. Do you enjoy cooking Italian food? I am not a great cook, but the ingredients are so fresh with few pesticides, that if I enjoy cooking anywhere it is here. Particularly on the rare occasions when I have a peach Bellini in one hand and a handful of herbs from my meadow in the other. Do you have a favourite Tuscan recipe or dish you can share with us? One of my favourite recipes that my children love, is Italian chicken with Pomodoro sauce, taught to me by my great friend Giussepina who cooks for the famous Italian author of Under the Tuscan Sun. 12 chicken breasts sliced thinly as the Italians do so well even in the supermarkets. Flour the breasts, season and add lemon juice to both sides. Prepare a first course of pasta and serve this dish as a ‘secondo’ with green beans or a salad on the side. It is delicious. Italy, 1937. Alessandra Durante is grieving the loss of her husband when she discovers she has inherited her ancestral family seat, Villa Durante, deep in the Tuscan Hills. Longing for a new start, she moves from her home in London to Italy with her daughter Diana and sets about rebuilding her life. Under the threat of war, Alessandra’s house becomes first a home and then a shelter to all those who need it. Then Davide, a young man who is hiding the truth about who he is, arrives, and Diana starts to find her heart going where her head knows it must not. Back home in Britain as war breaks out, Alessandra’s son Robert, signs up to be a pilot, determined to play his part in freeing Italy from the grip of Fascism. His bravery marks him out as an asset to the Allies, and soon he is being sent deep undercover and further into danger than ever before. As war rages, the Durante family will love and lose, but will they survive the war…? Don’t forget to enter our Prize Draw! We teamed up with Catherine’s Publisher Orion Publishing and Prima Magazine to offer you the chance to win one of our luxury Italian gourmet hampers. Find out how to enter here.